Study the diagram of the fractionating column. What fractions come out at X and Y? From which fraction of crude oil are central heating fuel and jet fuel obtained? The main constituent of natural gas is methane. From the list below, select two other gases that make up natural gas. To give natural gas a smell so that leaks may be detected. In order that it may be more easily stored. To increase its octane number. Damage may be caused to the internal combustion engine by premature ignition of the fuel:air mixture. Premature ignition may also be expressed by three other terms. Select these three terms from the list below. The octane number is a measure of a fuel's tendency to auto-ignite. In fixing a scale of octane numbers from 0 to 100, two compounds were chosen and assigned numbers 0 and 100. To prevent knocking in petrol engines, compounds called oxygenates are added to the petrol. Which one of the following is NOT considered an oxygenate? High-octane compounds are used to prevent knocking in petrol engines. Which one of the following features is not present in high-octane compounds? Low-octane compounds may be converted into more desireable high-octane compounds by which THREE of the following processes? 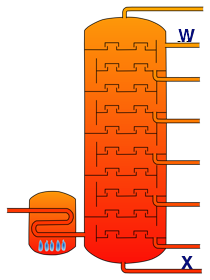 Catalytic cracking involves taking a heavy oil and heating it to a high temperature in the presence of a catalyst. Useless, long-chain compounds are converted into more useful shorter chain compounds. High-octane, branched chain alkenes are made which are suitable for petrol. Alkenes, suitable for the manufacture of polymers are made. Hydrogen gas, used in making ammonia is produced. Which one of the following is NOT a property of hydrogen gas? It is a very dense gas. It is a colourless gas. It is almost insoluble in water. It is an odourless gas. Which one of the following is not a use of hydrogen gas? Butane is a major component of LPG. What two structural features of 2,2,4-trimethylpentane results in it having a high octane rating? It has three methyl branches. It doe not contain oxygen atoms. Lead compounds were used in the past to increase the octane number of fuels. Why are lead compounds unsuitable as additives for petrol in modern cars? Lead compounds poison the metal catalyst in the catalytic converter of the car. Lead is a very expensive metal. Lead compounds are not very soluble in petrol. Lead compounds in petrol reduce the speed of cars. The table shows the octane numbers of some hydrocarbons. Hexane has the lowest octane number of the four compounds listed. What structural feature of hexane contributes to this? Hexane has a straight chain. Hexane contains a ring structure. It does not contain lead. It does not contain oxygen. Benzene has the highest octane number of the four compounds listed. What structural feature of benzene contributes to this? It contains a ring structure. It has a long chain. It has branches along the molecule. Oxygenates are added to petrol. To increase the octane number of the petrol. To decrease the toxicity of the petrol. To make the petrol less flammable. Which one of the following is NOT a reason for using methyl tert-butyl ether (MTBE) in the petrochemical industry? To help crack long chain hydrocarbons. To increase the oxidation number of a fuel. To prevent knocking in a petrol engine. In which fraction of crude oil does pentane and its isomers occur? Which one of the following has the lowest octane number? Naphtha and gas oil are two of the hydrocarbon fractions obtained from the fractional distillation of crude oil. How do the molecules of the naphtha fraction differ from the molecules of the gas oil fraction? Naphtha molecules are smaller than gas oil molecules. Naphtha molecules have greater densities than gas oil molecules. 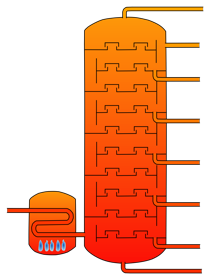 Naphtha molecules have lower boiling points. Gas molecules have higher boiling points. 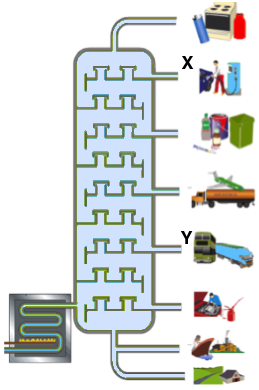 Name the fractions X and Y which are separated in the fractional distillation of crude oil. Crude oil is separated into a number of fractions. Select two fractions which contain molecules with their carbon lengths suitable for petrol? Which one of the following is a use of the kerosene fraction obtained when crude oil is fractionated? The straight chain molecule C13H28 occurs in the kerosene fraction. When this molecule is cracked, a C2H4 molecule, a C4H8 molecule and an unbranched alkane molecule are obtained. What is the unbranched alkane molecule, what is its octane number? What two processes are carried out in oil refineries to modify the octane number of hydrocarbons? What is the major use for the light gasoline and naphtha fractions of crude oil? Which one of the following is NOT a use of catalytic cracking? State one disadvantage of using hydrogen as a fuel. It is difficult to store. There is no pollution from burning hydrogen. Burning it does not produce carbon dioxide. Hydrogen fuel cells are very efficient. In the fractionating column shown, what fractions come out at A and B? In the fractionating column shown, what fractions come out at X and W? 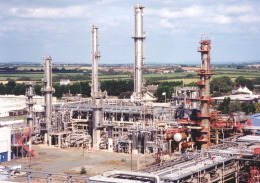 Which one of the following is not a refinery process? one or more of the products must be unsaturated. there are always just two products. there must be at least one branched product. Which one of the following methods does NOT lead to an increase in the octane number of petrol? Which one of the following is NOT a factor affecting the octane number of a fuel? The addition of a catalyst to the fuel. The length of the alkane chain. The amount of branching in the chain. The presence of a cyclic structure in a hydrocarbon gives it a higher octane number. as a source of medicines, plastics and detergents. as lubricating oil in engines. Which one of the following fractions of crude oil has the longest chain of carbon atoms? Which one of the following types of compound is added to natural gas (methane) in order to detect a leakage of that gas?